I’ve been on a bit of a development sprint this past week, spending an inordinate number of hours working on GigPress, and the results so far are heartening. I’ve completed a tonne of code optimization and security enhancements, reduced almost all redundancies, and done all of the re-architecting required for the upcoming version. The admin-side of GigPress 1.5 is 90% done, and I’m very happy with it. I figured I’d give a small preview of what’s in store. UPDATE: I may have lied about the whole “no templating” thing. And it’s looking like this will actually be GigPress 2.0, not 1.5. That’s it — carry on! So, what’s new in version 1.5? The big feature that I’ve been asked about (and promising to deliver) for a while is multiple bands. Labels and booking agencies will be happy to hear that multi-band is finished and ready to go for GigPress 1.5. On upgrade, all of the shows in your database will be assigned to your first artist, which will be created based on the contents of your “band name” setting. From there, add as many artists as you like, and choose them from a drop-down when adding new shows. The tours feature remains of course, and you can have multiple artists on the same tour (tours relate only to shows, not directly to artists). With more data to manage for each show, I decided it was time for the upcoming shows administration to get overhauled. As you can see below, it’s now much easier to find specific shows, with a unified screen that gives the ability to filter based on date (past or upcoming), artist, tour, and venue. 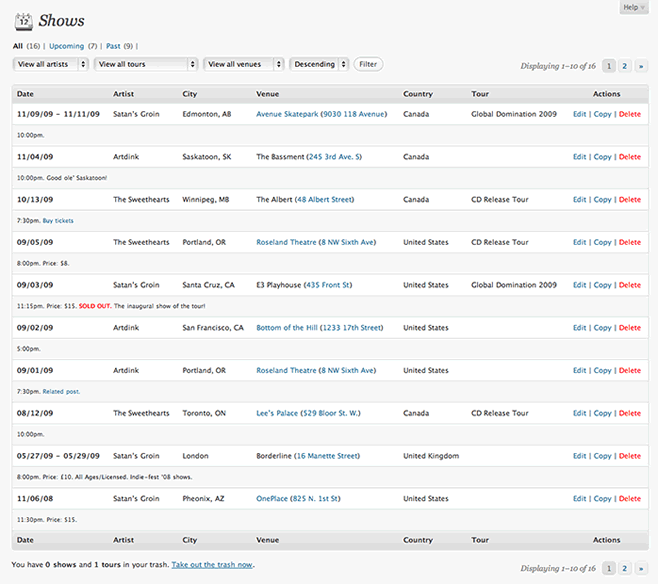 Plus, shows in the admin are now paginated (as are all other relevant screens in the GigPress admin). As you might have gleaned from the screenshot above, while re-engineering the plugin to add the new relationship for artists to shows, I decided to honour another oft-requested feature, which is a venues database. Apparently a lot of you folks play the same venues frequently, and are sick of re-entering it all the time (despite help from browsers’ intelligent form-filling). When you upgrade to GigPress 1.5, your new venues database will be automatically populated with all of the venues previously played. From here, there’s a lot of front-end work to be done to incorporate the multi-artist aspect and figure out how to best present this new level of hierarchy. I also plan on expanding the capabilities of the [gigpress] shortcode, with the ability to control grouping, filter by artist, etc. The RSS feed is also getting the ability to filter by artist, tour, venue, or any combination thereof by using a simple query string in the feed URL. I’m also hoping to add pagination to the front-end (even if I’m not entirely sure how yet, haha). What’s not going to be in GigPress 1.5? Templating. Any sort of templating. Sorry, I really wanted to, and spent a lot of time thinking about it, but there are just too many conditionals involved, and I’m not about to write my own template parsing engine. For now, you’re stuck with the markup I write and the classes I add. After I get the front-end stuff finished, I have to send out updated language files to all of the kind people who’ve translated GigPress into 15 different languages. So, I can’t promise when you’ll see it in your plugin update notifications, but hopefully sometime in September. One last note – GigPress 1.5 will only be compatible with WordPress 2.6.5 and higher, so if you’re running an older (and consequently insecure!) version of WordPress, and depend on GigPress for your site, consider this your call to upgrade. That’s it for now. Thanks for all the kind words and support for the plugin. If you’re as excited as I am about version 1.5, maybe consider making a donation to the cause? Great work, can`t wait till it finally arrives! Just wanted to say THANK YOU for an incredible plug-in! Crossing my fingers that GigPress 1.5 will make it out the doors soon, coz I’m in desperate need of an import function! Thanks, Derek. You are so appreciated! I can’t wait to try it out and translate it in French! This new version of GigPress will be so much more powerful I just can’t believe it! Hi Derek, I’m just after sending you an email asking about using the plug-in for multiple artists. Then I came on to this post. I’m eager to see the new GigPress. Thank you for the great work you put in. I might be able to help you translating into Romanian language, if you are interested. AWESOME! I love this plugin and I can’t wait to see the new version! Multiple bands/saved venues are great features, I know I’ll be using both. OK and for the real elephant in the room, where can I hear Satan’s Groin? Good to know you’re all excited about the release. I finished off the importing function and a bunch of other tweaks over the last few days, and things are working great. I’m pretty stoked. @fluff – Satan’s Groin perform on a frequency too low for the human ear to detect. You’re actually listening to them right now, you just don’t know it. Great news! Let me know if you need any help beta-testing or swedish translation. Thank you for this plugin! After searching the web, I found that nothing comes close. One thought to throw out there, however – I would like to be able to insert some kind of “Share This” button onto each post in my “upcoming shows” that would link a user to the related post. I’m sure this is possible to implement into the formatting, I’m just not sure how difficult it is. Also, is there any way to get the information I enter for each show to automatically populate a new related post? I find I have to copy all the information by hand to make an adequate info page for each show. Maybe there can be a shortcode to “view single show” or something? Hey Derek…This is a great plugin, I really love it an appreciate it! Thank you sooo much for all of the work that you have put into this (and continue to do). In regards to what Rich was asking, I’ve had an idea about this too. Currently, when you add an event, you have to go and add a post with that title, either first and then create the event and link it in the admin panel…or…after you create the event and then go back to admin panel to link it after post is created. Please let me know if that makes sense….Thanks again…You Rock! Just toying around with it. Is there a way to have the Ticket links in the widget ? @Jeremy – this is in fact already part of the plug-in. Just select “Add new post” from the “Related post” drop-down when adding a new show. You can also have this option selected automatically by checking off the “automatically create a new post” option in the Settings. @David – not currently, but you’ll be able to add additional info to the widget in the upcoming version. is it possible show in the post linked to an event a list of the relative date? I’ve created two date linked to a post. If in this post I use the normal shortcodes I see the list of ALL the event. I want a list of only the event associated to post. @Dario – you can do this now by enabling the setting to display related show info in related posts. It won’t look the same as the main shows listing – that you can’t currently change. Bit it will show all info for the related shows in unordered lists. Love this plugin but would like some help or fix for the following if possible. The GigPress user role is set to contributor as I want members to be able to add / edit their own gig listings and related posts – unfortunately this setting displays ALL the GigPress functions including settings which could then be exploited or changed. Is it possible to set what is viewed by users depending on their role i.e., contributors / authors only see ‘add / edit / delete’ their own shows please? Also – I know that many backend admin functions are not accessible to users with Internet Explorer browsers but this is inconsistent with the majority of other standard features which can be accessed regardless of browser used like add / edit / post page – would it be possible to include IE functionality for the add/edit section of GigPress please? Finally – am really excited about the forthcoming release as one of the things I was going to ask about was the venues and multiple artists. Specifically being able to highlight the artist/band name which gets lost in the description area – yes I realise that html can be used as a work around – but most users don’t have that knowledge and frankly would prefer that html couldn’t be used as this prevents potential abuse – perhaps the inclusion of a ‘band/act’ name field that appeared above the description area automatically displays as bold would do the trick? Tracey – in 2.0, only admins will see the “Settings” link for GigPress. (In 1.4.x, although all users can load the screen, only admins can actually make changes.) No plans to introduce more complex permissions into GigPress though. Re: Internet Explorer – what exactly is not working in IE? GigPress has been tested in IE 6-8 and should work just fine. With the addition of multiple artists in GigPress 2.0, artist names will not be put in the notes area – they get their own column alongside Date, City, and Venue, so no need to worry about it getting lost. Thanks for the quick response! Very relieved to hear that 2.0 fixes the settings issue and artist names – can’t wait for it to be released!! Ah right thanks – hadn’t seen that post – thanks, removing WP-O-Matic fixed the problem ! !